Calm Coat – A True Miracle! When I rescued Mollie from the shelter, I realized that she had a very unfortunate and horrible upbringing as a pup. She was a very sweet and gentle from day one of owning her; however it was obvious she suffered from anxiety and was easily stressed. Mollie is nervous on a daily basis, like when an airplane goes by, the lawn guys are working on the yard, and thunderstorms are the WORST! She also gets very fearful when in the car. Almost anything can trigger her and at anytime. Her attacks of panting, barking, crying, shaking and pacing back and forth was heartbreaking for me to watch. I knew I had to do something! After much research, I discovered the Calm Coat. At first I was skeptical of this product because I assumed the shirt would make Mollie more anxious or scared. But I decided to give it a shot. In my opinion, this would be a way better solution than using the ‘doggy drugs’ or pet medications. When I received the Calm Coat, I did a few warm-up activities by placing treats on the shirt so Mollie would become familiar with it. I was very surprised because shortly after the treat introduction, Mollie allowed me to put the shirt on with a breeze. She was instantly comfortable in it, strutting around the house as if she was in a runway show modeling it off! (I love the material!) I found that it’s not necessary to wrap the dog tightly, just comfortably so that the dog has a greater sense of self! Now when Mollie sees the shirt she comes running to me to put it on her. But best of all, it has decreased her anxiety significantly! I use the Calm Coat almost daily; when we go for walks, play outside, in the car and of course during storms. It’s been a miracle! Mollie doesn’t panic nearly as much as she used to. I feel she senses security in the shirt which leaves me to believe the hugging technique works! 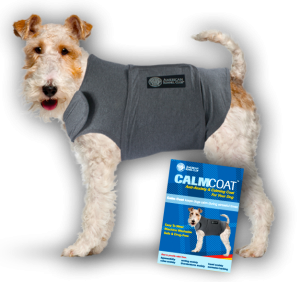 I’m amazed by the Calm Coat and I highly recommend for dogs who suffer from anxiety. It seemed to have cured 5 years for me and Mollie so it could be a great solution for you and your dog too! This entry was posted in Product Review and tagged Calm Coat, dogs with anxiety on August 12, 2013 by Rebecca Symon.